A year after creating the “Peanut Punch” t-shirt, “The Heckler” has invented another way for fans to show their support for Bears cornerback Charles Tillman and his Cornerstone Foundation. 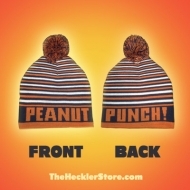 The satirical sports website is now offering “Peanut Punch” winter hats—and donating $5 for every hat sold to the charitable organization that Tillman created in 2005. The idea for the “Peanut Punch” t-shirts was born last season after George Ellis, managing editor and co-founder of The Heckler, watched Tillman force two fumbles by swatting the ball out of Detroit Lions tight end Brandon Pettigrew’s hands. What happened next was pure magic. Four days after the t-shirts were introduced, Tillman forced a career-high four fumbles in a 51-20 rout of the Tennessee Titans. Tillman caused a career-high 10 fumbles last season, tied for the most by any player since the NFL started tracking the statistic in 1991. He has added two more this year, increasing his career total to 41, the most by any player since he entered the league with the Bears in 2003. The Heckler raised about $10,000 for the Cornerstone Foundation via its “Peanut Punch” t-shirt sales last year, which paid for the organization’s annual holiday party for dozens of sick kids and their families last December at Rush Children’s Hospital in Chicago. Tillman and his wife Jackie hosted the party, passing out gifts while also posing for photos, playing games and making ornaments with the kids and their families. “It was really cool to be able to do that,” Zibung said. “I’ve done a lot of charity work and every cause that I’ve worked with is a good cause, but it’s great when you can raise money with something that people are having fun with. Tillman created the Cornerstone Foundation initially to provide children with educational opportunities and resources to excel in the classroom. But after his three-month-old daughter, Tiana, was diagnosed with a rare heart disorder and received a life-saving heart transplant in 2008, he changed the foundation’s mission to improving the lives of critically and chronically ill children.